Citrix report claims big changes are on the way concerning how data is stored. 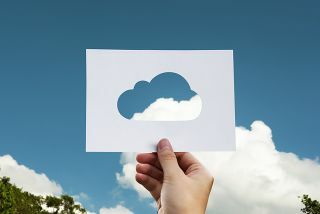 The cloud, as a technology, is going to be so firmly embedded in organisations within the next seven years or so, that the term 'cloud' is going to be phased out of existence. This is according to a new report by Citrix, based on a poll of 750 IT decision makers in companies with 250 or more employees across the UK, as well as a poll of 1,000 young people aged 12-15. A quarter (26 per cent) of IT decision makers believe the term 'cloud' will be obsolete by 2025. More than half of those (56 per cent) think it will be the case because of the cloud's omnipresence at that time. A third will talk about cloud-native apps, but won't know, or care, where the data from those apps is being stored. The younger workforce is on the same page. A third (30 per cent) don't know what the term even means, and another third (33 per cent) have never used it, outside ICT classes at school. Still, 83 per cent recognised cloud as a place where they store their photos and music, while 42 per cent confirmed they use it to share stuff. “Much like BYOD before it, this research indicates that cloud as a term may soon have had its day and be relegated to the buzzword graveyard,“ said Darren Fields, Regional Director, UK & Ireland at Citrix. “This has nothing to do with its relevance in the IT industry but everything to do with the evolution of technology and the ubiquity of cloud services to underpin future ways of working. “Most IT budget-holders agree that cloud can improve productivity, lower costs, ensure security and optimise performance, as part of a digital transformation agenda. However, there is still more education required to effectively communicate the benefits of cloud services – and there’s still a gap to be bridged between boardrooms and IT decision-makers in relation to this.